Anyone who complained about this is a first-class douchbag. 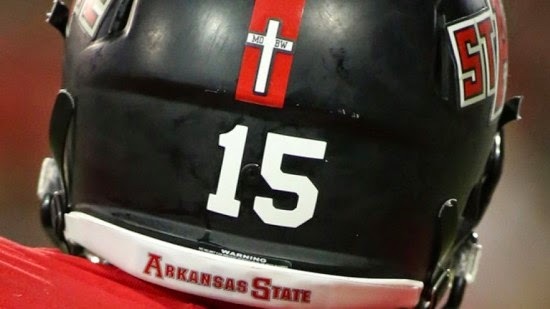 Football players at Arkansas State University were ordered to either remove a Christian cross decal from their helmets or modify it into a mathematical sign after a Jonesboro attorney complained that the image violated the U.S. Constitution. The cross decal was meant to memorialize former player Markel Owens and former equipment manager Barry Weyer, said athletic director Terry Mohajir. Weyer was killed in a June car crash. Owens was gunned down in Tennessee in January. Barry Weyer, Sr., told me that the players and coaches voluntarily decided to memorialize his son and Owens. It was a decision that had the full support of the university’s athletic director.